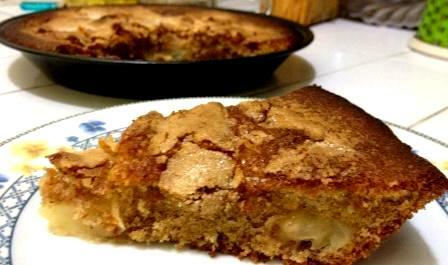 I have just taken a Dutch Apple Cake out of the oven, golden brown and crispy with preserving sugar on top, wonderfully light and fluffy inside, studded with molten pieces of hot apple… The house smells of hot sugar and cinnamon, and I could happily go to sleep now without eating another thing. My first hurdle was finding all the blinking ingredients – not because it’s a complex recipe (far from it), but because I don’t know the Turkish for them. Most were pretty straightforward to find, but I had no idea what the Turkish for baking powder was, and couldn’t find anyone to understand my pathetic attempts to explain that it was for ‘making cakes get bigger’. I bought a couple of sachets of likely-looking powders and Google-translated their names when I got home. I scored baking soda and yeast in the process, but no baking powder. Anyway, I found the translation (kabartma tozu), and it was easy to get hold of in the local market. My second challenge was figuring out how the bloody hell M’s oven works. I turned it on for the first time in two years yesterday, and was pleasantly surprised when it didn’t burst into flames (seriously, I don’t know when it was last used – M uses it to store pans). It’s electric, and got scarily hot in a matter of seconds, but it didn’t cremate my toast so I assumed it could handle a cake. The third obstacle was the total lack of cooking equipment in M’s kitchen (something I’m going to rectify, pronto). There are no mixing bowls, no wooden spoons, no small saucepans (only whopping great cauldrons for making soup), no whisk and, crucially, no form of measuring equipment. But I’m a girl who likes to improvise in the kitchen, so I used a small glass and guess-work, tweaking and tasting until I got a batter that looked vaguely right in consistency. Anyway, one piece of cake and a triumphal victory dance around the kitchen later, I can safely say this recipe is fool proof! Try it now. 1 cooking apple, peeled, cored and thinly sliced. Preheat the oven to 200˚C, then grease and line a medium sized cake tin. In a bowl, whisk the eggs, caster sugar and vanilla until it becomes thick and airy. You can do this with an electric whisk, but in the absence of one, a balloon whisk or even a fork will do (it’ll also give you a good arm out work out). In a saucepan, melt the butter with the milk, then pour this into the egg-sugar mixture, stirring constantly. Still stirring, add the flour, cinnamon and baking powder and mix gently until all there are no lumps left. Pour the batter into your greased and lined baking tin, then lay the slices of apple on top. 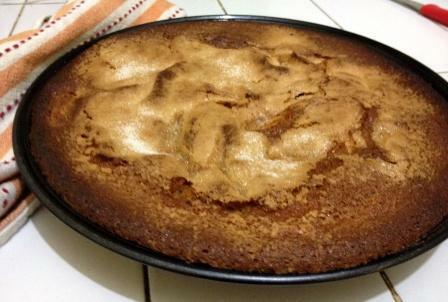 Finally, sprinkle a dessert spoon of sugar over the top and put straight into the warm oven. Cook for around 15-20 minutes, until risen and golden brown.